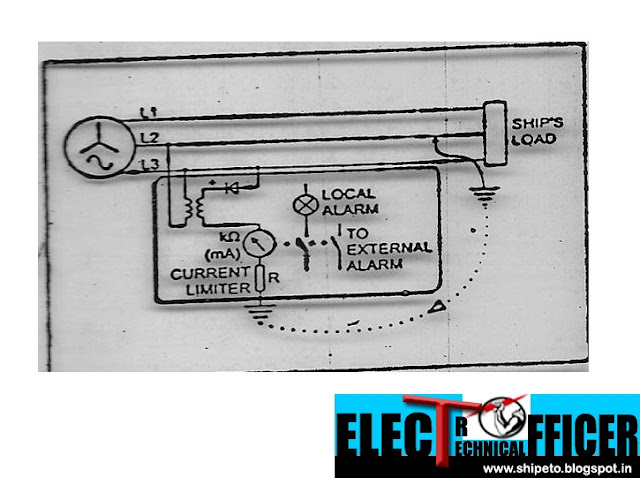 • When the voltage exceeds 1000V, then the neutral of the alternator has to be earthed. • The priority requirement on board ship is to maintain continuity of the electrical supply to equipment in the event of a single earth fault occurring. 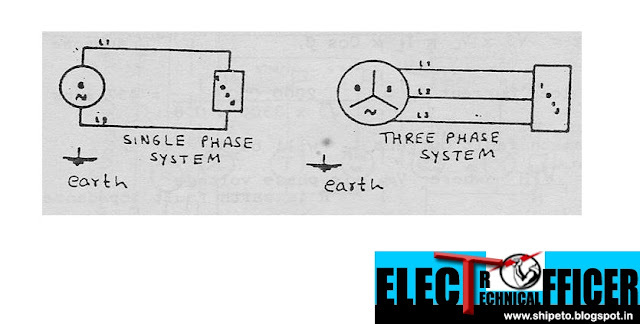 On an insulated system, one earth fault does not interrupt the supply but raises a warning on earth detection system. This allows the operator to locate and clear the fault. • As mentioned earlier, for the systems having more than 1000 V, the neutral will be earthed. 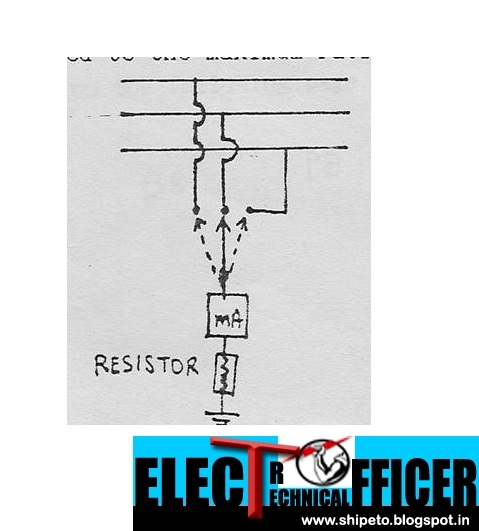 To protect the system against the high fault current, normally the neutral is earthed either through a resistor or a transformer. In case of earth fault, it is preferable that the fault current should not exceed the full load current of the alternator. • An open circuit fault is due to a break in the conductor so that the current can not flow. • An earth fault is due to a break in the insulation, allowing the conductor to touch the hull or an earthed metal enclosure. 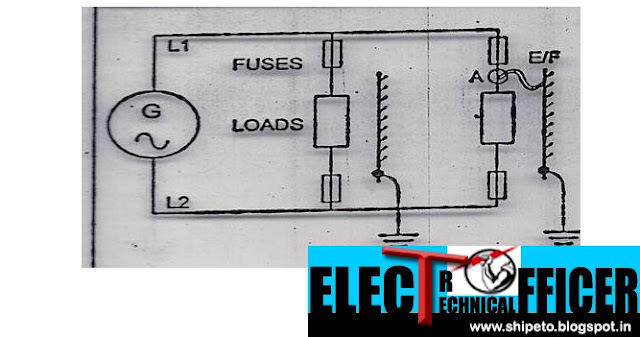 • It is due to a double break in the insulation, allowing both conductors to be connected so that very large current passes or short circuit occurs. 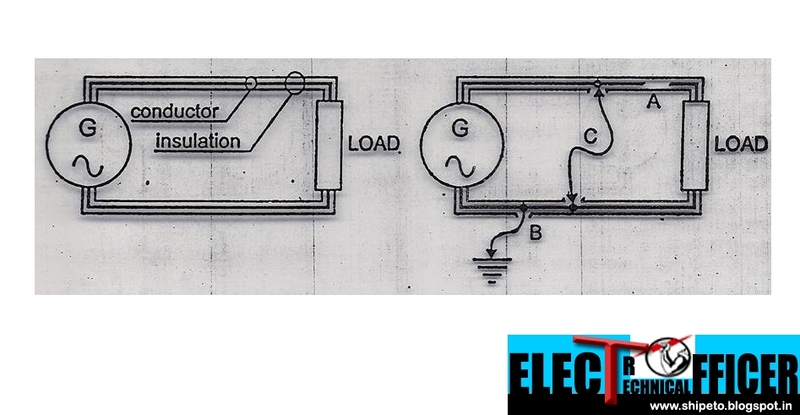 The fault current depends on the overall impedance in the circuit at the time of the fault. • Short circuit may occur because of breakdown of insulation due to over heating or ingress of moisture/water. • Terminal connections become loose due to vibration or any other reason, thereby two cables come into contact. • Cables exposed to fire, mechanical damage, cuts etc may lead to short circuit. • In order to protect against the dangers of electric shock and possible fire hazard, the metal enclosures and other non current carrying metal parts of the equipments must be earthed. This enables the potential at the time of earth fault to become zero and also provides a least resistance path for the current to flow to the earth. (ship’s hull). • If an earth fault occurs (assuming a earthed system), it would be equivalent to a short circuit fault via the ship’s hull. The resulting large current would immediately blow the fuse and supply to the equipment is cut off. If this happens to an essential equipment like Steering gear, then the ship will be having loss of control. The large current could also can cause arcing damage at the fault location. • A single earth fault occuring in an insulated distribution system, will not cause any protective gear to operate and the system will continue to function normally. 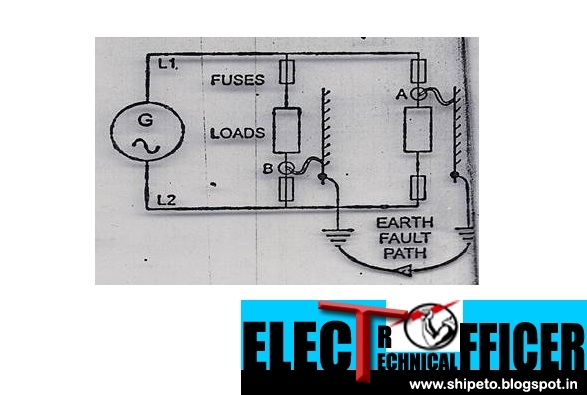 The single earth fault does not provide a complete circuit so no earth fault current will exist. • An insulated system is therefore more effective than an earthed distribution system, because insulated system requires two earth faults on two different lines to cause tripping of the equipment. • Regulations require that earth fault indicators are fitted to the MSB to indicate the presence of an earth fault on each isolated section of a distribution system. 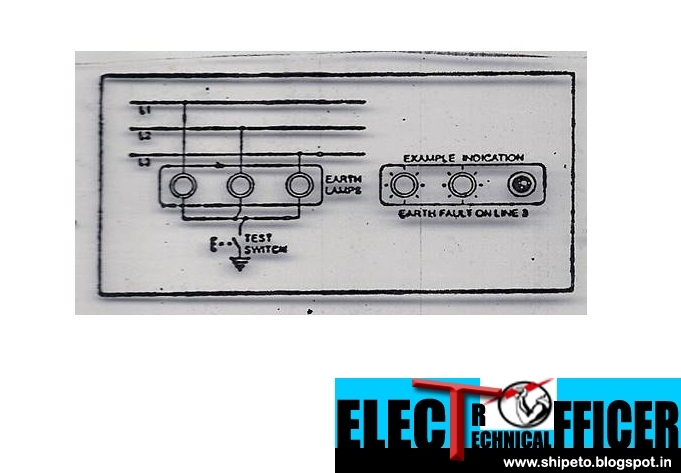 Earth fault indicators can be a set of lamps or an ohm meter calibrated in kΩ to show the system insulation resistance value to earth. • If the system is healthy (no earth faults) then the lamps will glow with equal brilliance. If an earth fault occurs on one line, the lamp connected in that line is dim or extinguished and the other lamps glow brighter. • The disadvantage of this system is that it is not very sensitive to indicate the presence of high resistance / impedance faults. • This system can incorporate a switch which will give off an alarm when the insulation resistance falls to the set value. Small DC voltage is injected into the distribution system. Resulting current indicates the insulation resistance. Maximum earth fault monitoring current is 250 μA. • 1. lamp fittings on open deck. • 3. in galley, the ovens, hot plates etc. • 4. dripping of water over electrical machinery. • 5. condensed moisture in the motor terminal box. • 6. overheated motors leading to melting of varnish on the windings. • 8. terminal lock nuts becoming loose due to vibration etc, leading to cable touching the body. 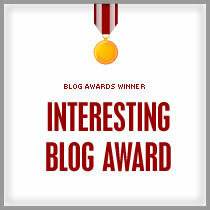 • 9. due to ageing, the insulation may crack due to brittleness, leading to possible earth faults. • Earth faults should be eliminated when located. • Damaged conductor insulation has to be repaired or renewed. • Dampness or moisture has to be removed by gentle and gradual heating using lamps. • Machinery should be kept clean of dirt and dust.